AN EXCITING NEW EXHIBITION OF RECENT PRINTS DONE IN COLLABORATION WITH BASIL HALL EDITIONS BY INDIGENOUS ARTISTS FROM 6 ART CENTRES WILL BE OPENED AT NANCY SEVER GALLERY IN JUNE THIS YEAR. Watch this space! 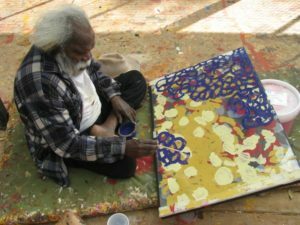 This will be an opportunity to see and acquire rarely seen original hand-made etchings and silkscreens by major artists from these communities: Beswick, Warmun, Kalka, Indulkana, Tiwi Islands and Raminginning. Come and support these talented artists in a new exhibition curated by Basil Hall.